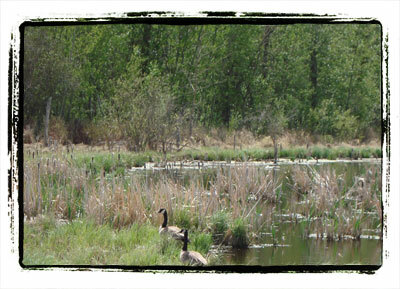 The Maple Ridge Wetland is located within the Maple Ridge Industrial area of Southeast Edmonton. This wetland-upland complex is a healthy and vibrant example of an urban wetland transitioning into surrounding upland deciduous forest. The site is comprised of a permanent water body with marsh grass and cattail fringe with a few patches of upland forest along its southeast and northwest margins. The wetland component is rich in emergent plants with many cattails, rushes, and sedges growing around its perimeter. There are a few scattered clumps of willow along the shore which offer good shelter and perching habitat for many small songbirds. In places where flooding has impacted adjacent trees, there are many snags that provide excellent habitat for raptors and cavity-nesting birds. Because of the diversity of habitats located at this site, it can support all the components of waterfowl life cycles. Dr. Access into this site is difficult. 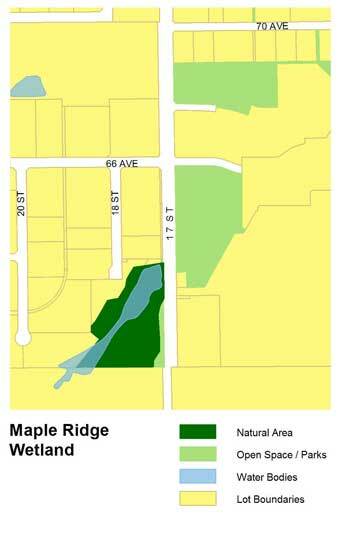 The Maple Ridge Wetland is located directly west of 17 Street N.W. and Maple Ridge Drive. There is a small parking lot located east of 17 Street that can be accessed from the entrance to the Maple Ridge manufactured home park and on the south side of Maple Ridge Drive. Caution should be used when crossing 17 Street to access the site. There are no formal trails at this natural area; however, the wetland and upland areas can be viewed from 17 Street while the more adventuresome can enter the site along its north-eastern edge to gain a closer look at the wetland, wet meadow, and upland forest along the western shore. Due to the high diversity of habitat types at the Maple Ridge Wetland natural area, many different species of animals can be seen and heard at this site. A variety of waterfowl, songbirds, and even raptors and cavity-nesters can be viewed here. As well, many small mammals, insects and amphibians inhabit the area. Previous studies have also catalogued over 90 plant species at this site, making it the most botanically diverse site within the Maple Ridge Industrial area.